I recently wrote an article outlining the likely earnings for Coinstar (CSTR) in 2012 based on the unit economics of its Redbox DVD rental division. The essence of the article is that if you look at the results of the average DVD kiosk over time, average monthly costs are consistently about $3,500, while the average revenue per kiosk per month has been steadily increasing. Because the costs to operate a DVD kiosk are relatively fixed, increasing revenues mathematically lead to higher profitability for each kiosk. In sum, a dramatic increase in profitability for Coinstar is likely to show up with a vengeance in 2012 and surprise everyone. (I estimated $5.40 in earnings for 2012). I would like to take another look at the kiosks and see how they might be performing based on their age. In other words, we know that when Redbox first introduces an individual kiosk, it likely isn’t that profitable. After all, the expenses (as shown in the previous article) on a monthly basis are likely $3,500 but not many people have “discovered” the kiosk or use it regularly. Coinstar management said in their Q1 2008 conference call, “kiosks typically produce negative EBITDA in the first year as they ramp”. After it has been in place for awhile and “seasoned”, the results of that kiosk improve as more revenues are generated to offset expenses and over time lead to increased profitability. So, how do we go about looking at the profitability of the average kiosk based on age? Well, we can run a waterfall analysis where we “place” each cohort of kiosks into a model to find the average kiosk age at any given point in time. The analysis looks like this. 2012 numbers are derived from adding management’s guidance of 5,000 new kiosks through year-end 2012. Note how the average age will continue increasing throughout 2012. At the end of 2011, the average age was estimated to be 2.69 years old. By the end of 2012, that number will increase to 3.29 if management sticks to its guidance of installing 4,000 – 6,000 kiosks this year. So, we know the average age historically and going forward based on our calculations. Now let us compare those ages to observed results. Let us compare the monthly expenses, the monthly revenues and the EBIT margins of Redbox based on the average kiosk age. When we model the monthly expense vs. the average age, we get an R-square of 34%, showing that the age only explains about 34% of the variation of monthly expenses. This is affirmation that costs are relatively fixed and not that dependent on age. Rather, expenses are more dependent on movie costs (and any management mistakes in over-purchasing titles) than simply time elapsing. The two aberrations are due to management mistakes in over-purchasing titles in Q4 of 2010 (see previous article) and the same in the latest quarter for games. With the two anomolies removed the R-square is down to %15.1%, or meaningless. 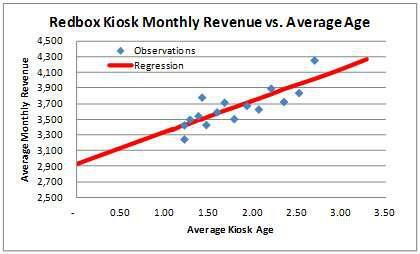 On the other hand, when we run a regression on kiosks for the average age vs. monthly revenue per kiosk, we get and R-square of 66%. That means 66% of the variation in average monthly revenue per kiosk can be explained by its age, or “seasoning”. What this regression shows us is that the average box will have $2930 in monthly revenue at its introduction and gain $404 in revenue per year it is in service. The actual numbers likely look slightly different than this, but not terribly so. In fact, in its Q4 2007 conference call, management stated, “A Redbox kiosk that has been operating for at least one year generates revenues of approximately $40,000 to $45,000 per annum.” If we take monthly revenues of $2930 at time zero, add $404, we get $3334. Multiply that X 12 for yearly and that comes out to $40,008, or very close to what management stated in Q4 2007. So, as a DVD kiosk become seasoned, it does more revenue, about $4800 per year more, in fact. Note the tight fit of the observations to the regression line relative to the monthly expenses. 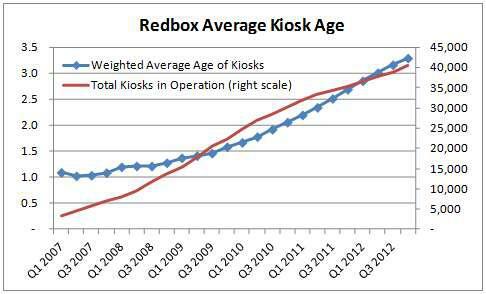 It shows that as the Redbox kiosks age, they should see greater and greater revenue. 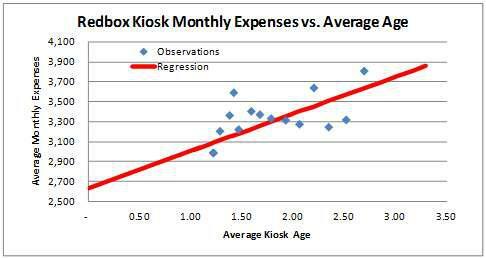 Just like in the last article I wrote, that means that profits per kiosk should go up as expenses are relatively steady. If we know that expenses are relatively fixed and revenues go up with age, then margins should increase as well! 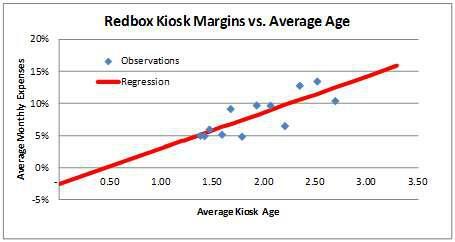 In fact, the margins have an R-square of 63% relative to the average age of a kiosk! Now a statistician will note that the P-value for the intercept shows it is not statistically significant. This is a minor issue for this exercise as we are more interested in the slope of the line (the amount of margin improvement for 1 year increase in average age). So, what happens when we put all of these results into an earnings model with modeled revenues and EBIT margins for 2012 based on our regression results? Note, I will adjust for the 20% price increase since all but Q4 data reflected the pre-price increase results in the regression model data and results. Remember, in my previous article looking at DVD kiosk unit economics I came up with a reasonable estimate of $5.40 in EPS for 2012. This model, with a different methodology comes up with $5.91 for 2012 EPS. 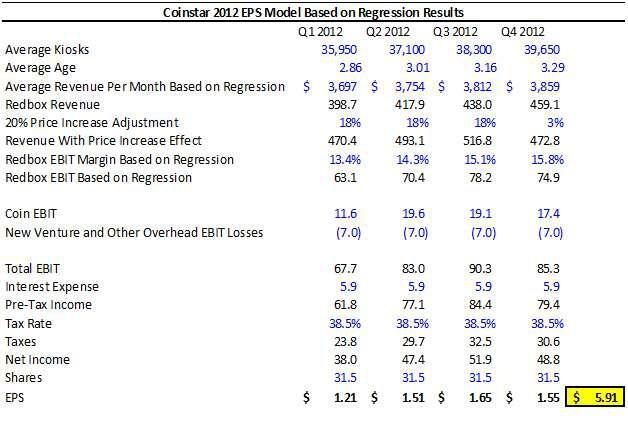 Given that Wall St. currently estimates earnings for 2012 of $4.09, it is safe to say I am very bullish on 2012 results for Coinstar. You should be too! Next: Redbox’s $100 million purchase of Blockbuster Express DVD machines — Will it hurt or help new Redbox business owner wannabes?